The first function of the ISTP is Introverted Thinking. Introverted Thinking deals with sorting out information and observations logically. The ISTP wants the world to make sense, and spends a great deal of time thinking about how and why things work the way they do. Introverted Thinking is very good at forming an internal framework of things and building a working “system” or “web” of logic that can be taken and readily adapted to many new interests. They are good “problem solvers” and take in many facts and details to help form a more complete picture of a situation. The second function of the ISTP is Extraverted Sensing. Extraverted Sensing is more about living in the moment and taking in details through the five senses. 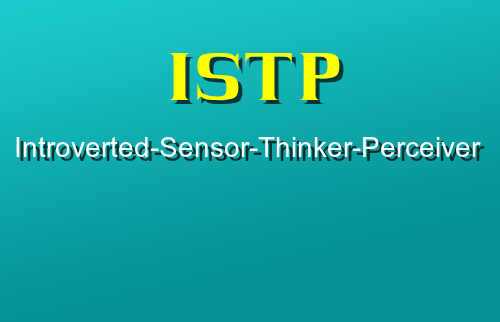 The ISTP uses this function to gather information about their environment. They ISTP is also attracted to things that test their physical limitations. You can see some of them in extreme sports and other adrenaline pumping events. Extraverted Sensing helps the ISTP to get more information about the world. An ISTP that underuses this function may come to incorrect conclusions about things because they haven’t experienced enough data and events to form a better picture. The third function of the ISTP is Introverted Intuition. The ISTP develops this function a bit later in life. Introverted Intuition can help the ISTP to see the bigger picture and become better at more strategic planning of events. The ISTP can also get “gut feelings” about things that they should or shouldn’t do. A very athletic ISTP can almost “push the boundaries” of their physical limitations by just having a sense of what is possible based on years of experience. An ISTP that puts in the time and effort can become an uncanny “expert” in their field by being able to quickly size up and solving problems that seem impossible to others.